(July, 2012) Sandra and I currently live and work in Richmond, British Columbia. We are of Portuguese decent and music is a passion that runs through our bloodlines and gives us the ability to perform an almost unlimited repertoire of songs. My musical skills were self-taught at an early age; first on the ukulele, slowly progressing to both the guitar and keyboard. My guitar skills were inspired by my idol and inspiration, the late Chet Atkins. I currenlty teach 'fingerstyle' guitar to several students from various age groups, I also organize concerts for my students to display their musical expertise. Sandra was born with a piano in hand learning to play at the tender age of 3 years old and ultimately completing the Royal School of Music Board Examinations. Sandra's roots in music were instilled by her late father, a well-renowned and accomplished musician, performer and entertainer. Early in her school years, she showcased her flare for music; extending from the Junior as well as Senior Adult Choirs. Her participation in the Convent School Brass Band (as a bell lyre player), the Youth Orchestra (playing the viola) and various orchestral ensembles honed her musical abilities. We have performed at birthdays, weddings, anniversaries, fundraisers, home & garden parties along with seasonal events such as Christmas parties and Easter banquets. We have also had numerous long-term residencies at various establishments including Café Vasco Da Gama, Alto Douro Brazilian Restaurant and A Taste of Portugal located in Vancouver, British Columbia. We also enjoy performing at charity events and entertaining at Senior Homes in the area. 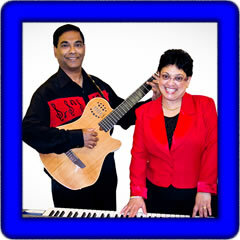 We belong to the music ministry in our Church with Sandra playing the Piano and I the Guitar for Sunday worship services. "Special thanks go out to all of you who continually prayed, encouraged and supported us with our music endeavors all these years. We hope you enjoy our site and all it represents as these songs have been a part of our lives for as long as we can remember, and many have very special meaning to us. Thanks for your motivation to listen to us."